Last weekend my neighbors had us over for one big BBQ before school started. Toward the end of the evening, the fire pit was lit and the marshmallows were brought out. It was S’more time!!! I couldn’t tell you the last time I had a s’more. It had probably been years, to be honest. At first, I wasn’t going to eat one… I was just going to let the kids enjoy it and watch. But, then my wonderful husband roasted the perfect marshmallow. You know… golden on the outside, soft and gooey on the middle… perfect. And, I wanted it. So, I made him give it to me… smushed next to a hunk of Hershey’s chocolate inbetween two graham crackers. First bite. Heaven. Why don’t we make these more often? I ended up eating two whole s’mores. Yeah. I know, why did I stop at two? 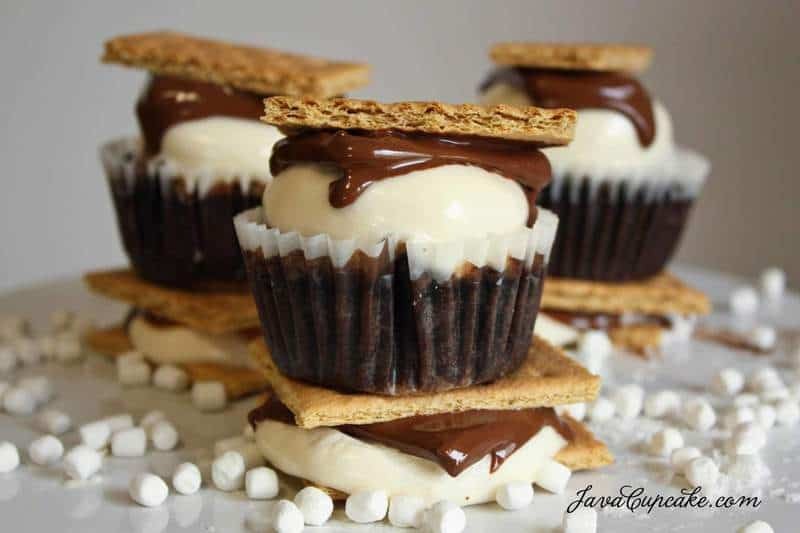 haha But… all this s’more goodness got me to thinking about making a s’mores cupcake. One last tribute to the summer, the neighborhood bbq’s and the amazing deliciousness that is graham cracker, chocolate and marshmallow. So… this cupcake was born. 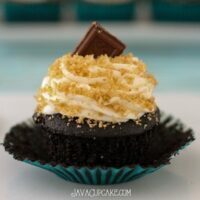 The “End of Summer S’mores Cupcake.” It’s simple in it’s ingredients. Graham cracker crust, my favorite chocolate cake topped with toasted marshmallow frosting and garnished with a chunk of graham cracker and chocolate… but the flavor is all s’mores!! YUM! Before the summer is over… make these for your family or neighborhood friends. One last tribute to summer and all it’s fun! Fill cupcake liners 3/4 full. Bake for 18 minutes or until a toothpick comes out clean. In a small bowl, combine graham cracker crumbs, butter and sugar. Mix together until completely incorporated. Reserve 1/4 cup for garnish. Cream together the butter and marshmallow fluff. Add the sugar, vanilla and salt and mix on high until combined. Add enough cream until you get your desired consistency. Beat on high for 5 minutes or until light and fluffy. Using an apple corer, remove the center of each cupcake. 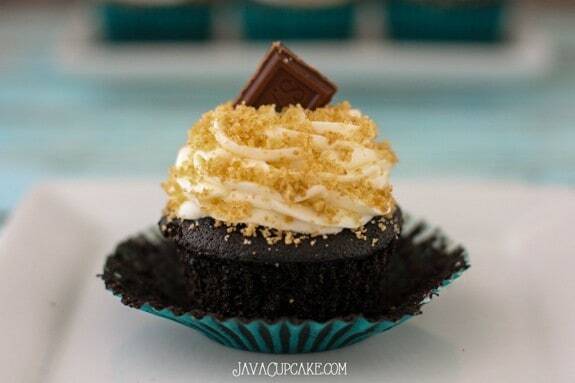 Fill each cupcake with the graham cracker filling. Pack the filling tightly into each cupcake by pressing down and adding more until the filling reaches the top. Using a Wilton 1M tip fitted on a piping bag, pipe swirls of frosting onto each cupcake. Place 1/2 a square of chocolate onto the top of the frosting. Sprinkle reserved graham cracker filling onto the frosting. Keep stored in an air tight container up to a week. Left over marshmallow frosting and chocolate? 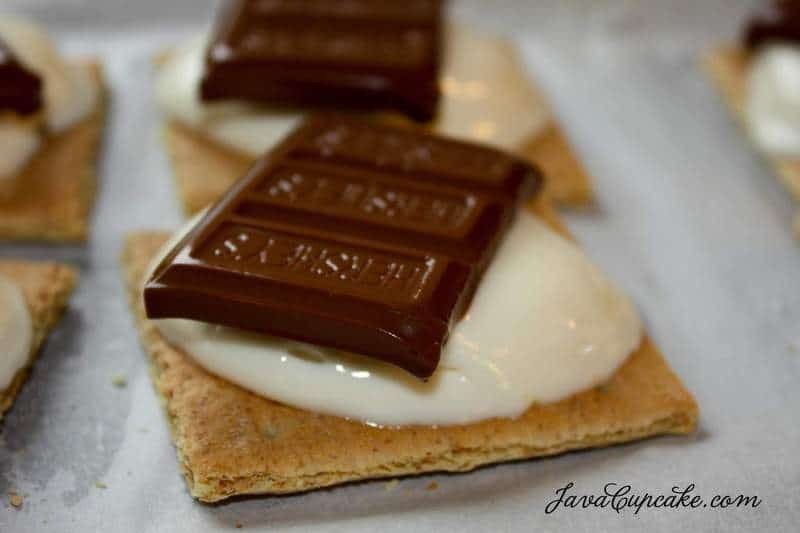 Make real s’mores! 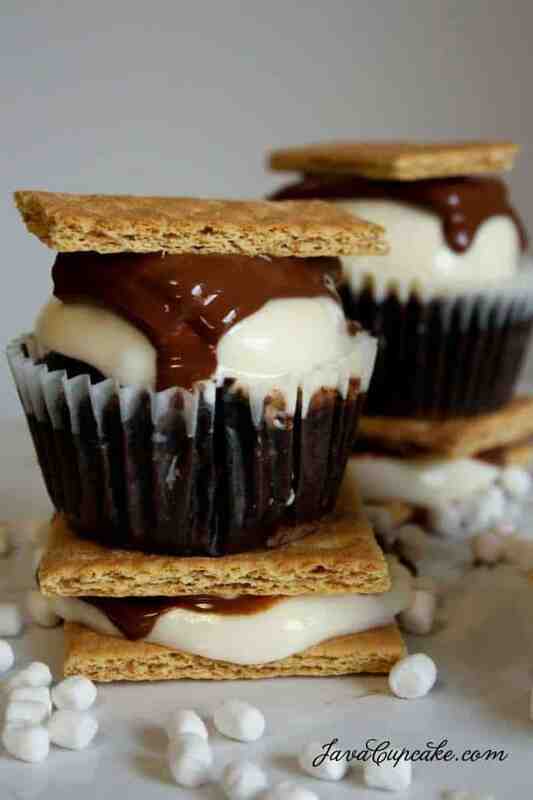 I’m OBSESSED with s’mores. I eat them more often than I’d care too admit…but still not often enough. I need to eat them more often. Yum-o! Can you make these ahead of time? I am going to a BBQ on Sunday but was going to make them Saturday night…can this be done? I ate these 3 days later and they were still good 🙂 So I think the night before would be okay. The only thing is that the graham cracker won’t be crisp anymore, it gets soft sitting out. Hi I’m making these tomorrow for a dinner party, I know this might be a dumb question but vanilla you mean extract correct? And also if I wanted to can a use a regular chocolate cake mix? I don’t plan on in it but I just wanted to check. Thank you! Yup…. vanilla extract! And you could use whatever kind of cake you wanted! 🙂 The creativity is up to you!